Laboratory heating systems are subject to numerous safety standards and protocols because they are so readily available and potentially hazardous. Great concerns are taken to ensure that heating systems are manufactured to exacting standards and from the most thermally-efficient materials. Yet there are still individual considerations for heating systems comprised of different components, including: heating elements; thermal insulation; and temperature controllers. Temperature is a crucial variable used to control and monitor all manner of laboratory processes. Researchers routinely manipulate the temperature of chemicals or elements to characterize their properties under varying thermal conditions. Typical experiments using laboratory heating systems may require researchers to maintain stable temperatures, to encourage gradual phase transitions, or to control rapid and potentially volatile heating of compounds. 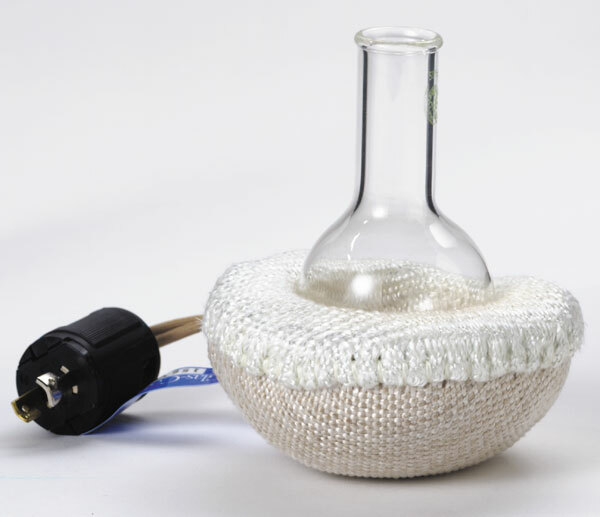 Heating mantles are designed to accommodate the safe heating of laboratory glassware and drastically reduce the risk breakages due to thermal shock. Heating systems such as hot plates or Bunsen burners apply direct heat or flame impingement to a sample container, which can cause localized mechanical corrosion and shattering of glassware. The benefit of mantles is that they are insulated with thermally-efficient materials to improve temperature uniformity throughout the component. Typical heating mantles are crafted with a robust aluminum housing and packed with insulating fiberglass fabric to remove direct contact between glassware and heating elements. Specialized fabric heating mantles have been designed to remove the rigidity of the housing all together, providing exceptional cushioning and heat uniformity for delicate glassware. These heating systems are designed specifically to improve the safety standards of heating processes in laboratory environments. Their fabric interiors are capable of withstanding 400°C (752°F) internal operating temperatures, and can be custom-built to exacting application-specific requirements. Ribbon heating systems are ingenious methods of heating smaller sample containers with a vastly reduced footprint. They are typically comprised of heating elements embedded lengthwise into glass-reinforced tapes and cords, with varying output temperatures and maximum voltage inputs. Electrical heating systems consistently come with moisture and vapor-related warnings, as water interference can cause hazardous component malfunctions – and different products tackle this issue in different ways. Glas-Col supplies multiple wrap-around heating systems with unique safety concerns. Our grounded heating tapes are overbraided and grounded to improve their safety capabilities, with a locking connector to near-hermetically connect electrical components to power supplies. We also offer two distinct temperature grades of heating cords, with 400°C and 600°C (1112°F) variants. Neither of these components are suitable for high-moisture applications, however these heating systems are designed with quick-removal and termination in mind. At Glas-Col, we understand the need for a range of heating system functionalities to suit low, medium, and high throughput laboratory environments – but each of these capacity grades requires the same stringent levels of safety considerations. If you would like any more information about our heating systems and their safety certifications, please do not hesitate to contact us.